At Kingmoor we believe that we need to allow children to develop the necessary skills to become life long learners. 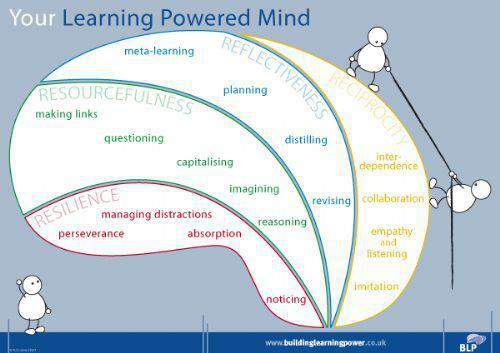 To enable us to focus on this we have used Professor Guy Claxton's 'Building Learning Power'. This means that as well as teaching e.g. English or Math's skills we will also teach 'noticing' skills or 'perseverance'. This allows us to nurture the 'whole' child so that they are ready for the next stage in their learning. He has categorised the 'Learning brain' into 4 sections: Resilience, Resourcefulness, Reflectiveness and Reciprocity. These are then subcategorised into seventeen capacities or learning skills (as shown below) which are the skills that we want to nurture in each child.